On 19 October 2017, an astronomer at the Haleakala Observatory, Hawaii, spotted an object passing through our solar system on an unusual hyperbolic trajectory. The strange cigar-like shape of the object lead some to speculate that it could be the product of an extraterrestrial civilization. However, the object doesn’t appear to be emitting any signals – although further observations are planned – and it is likely that the object is of natural origin. Originally considered to be a comet, and then an asteroid, the object has now been given a completely new formal designation by the International Astronomical Union – 1I/2017 U1. The 1I in the designation indicates that it is the first object to be assigned an ‘I-number’ as a new class of interstellar objects, and the 2017 U1 follows the standard naming convention for small solar system bodies. The object’s discoverer, Robert Weryk, has also given it the official name Oumuamua, a Hawaiian word meaning “a messenger from afar arriving first”. Observations of Oumuamua show that it is relatively featureless, with a reddish hue, similar to Kuiper belt objects. Oumuamua is also highly elongated in shape, roughly 230 × 35 × 35 metres in size. Calculations of Oumuamua’s trajectory show that it appears to be passing through our solar system, rather than being gravitationally bound to the Sun, and will eventually return to interstellar space. Oumuamua originated from the direction of the star Vega in the constellation Lyra. It is considered likely that it was ejected from a closely separated binary star system, as objects orbiting a star in a binary system are more likely to be ejected due to the gravitational influence of the second star. As well as allowing us to study an object originating from outside our solar system, Oumuamua could help us to learn about how our own solar system formed. 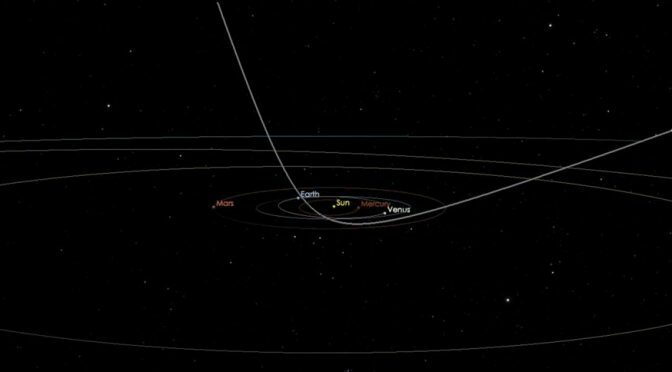 It is likely that there are many similar interstellar objects, passing through our solar system on a regularly basis. Studying them could allow us to calculate how much debris is left over from star formation and how much this adds to the mass of our galaxy.